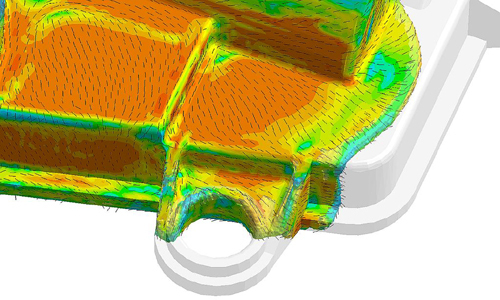 As the demand for fiber reinforced plastic parts increases, so does the need for accurate material models to predict mechanical performance. SIGMASOFT will contribute to the topic at the Kunststoffe + SIMULATION 2015 conference. Fiber orientation is nowadays a result present in most simulation software packages commercially available. However, sometimes the measured fiber orientation differs from the predicted value, without apparent reason. These models depend on the accuracy of the predicted fiber orientation in the injection molding simulation. SIGMASOFT Product Manager Timo Gebauer will explain which boundary conditions are required to obtain an accurate prediction of fiber orientation at the Kunststoffe + SIMULATION 2015 conference. Hosted by Hanser Verlag, Kunststoffe + SIMULATION 2015 will take place in Munich, Germany from April 22-23. His presentation describes the challenges faced when calculating fiber orientation in injection molding simulation. The classical models used to predict fiber orientation will be addressed, as well as the measured material data and input parameters used to feed these models and their influence on the simulation results.